As I have previously written, I started collecting these little lovelies probably almost 30 years ago, after being gifted some by my vintage-living sister-in-law Wendy. This gift coincided with the birth of eBay, and I was hooked. Most of the fun pieces in my collection are ceramic, and must include a retractable measuring tape. I have made exceptions over the years, but have not fallen prey to the thousands of other types of pincushions that have been created as long as humans have been sewing. Mine must also qualify as cute, able to make me smile. Here are just a few examples. More coming in future posts. Some have a space for the mini-scissors. This is an unusual piece. I’ve not seen one for sale in quite a while. Pins go in the pouch. These crafters have found many interesting ways to include the pins and the scissors. And I particularly like the scissors as glasses. Seems to make them even cuter. A “crown” is often added for the pins. An second elephant, equally charming. And sometimes these pincushions had friends. The scissors, pen holder, measuring tape figure was perhaps at the desk or even the telephone stand, waaaaaaay back when telephones were stationary, some even attached to a wall. Sometimes I wonder if stitchers actually used these. Some come with so many pins stuck in them that I think they might have been used often. Hope you enjoy the pix. All through the 80’s and 90’s I collected vintage fabrics from a variety of sources. The only fabrics I collected had to have two characteristics: I had to like the prints and the fabrics had to be inexpensive. 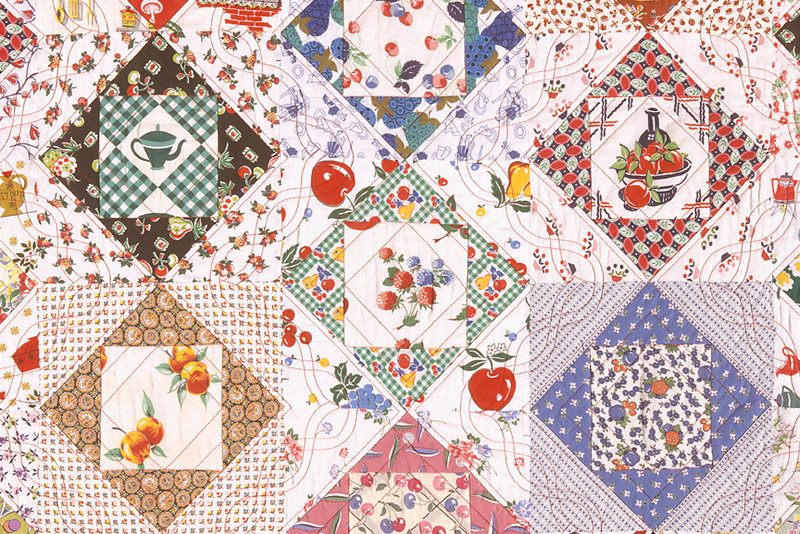 I collected a lot of feed sacks and feed sack pieces, as well as cotton broadcloth, and soon I noticed I had quite a pile of fabrics with food themes, “conversation” prints, in the quilter’s jargon. After making a couple of other quilts from vintage scraps, I started on the Food Quilt in 1995, finally cutting into some of the larger chunks of these “precious” fabrics. The block pattern I used was this simple Square in a Square, after rejecting many, many other blocks that had a central square for showcasing these great prints. Getting all the blocks together in a pleasing array was a challenge. Even more challenging was the zigzag border. 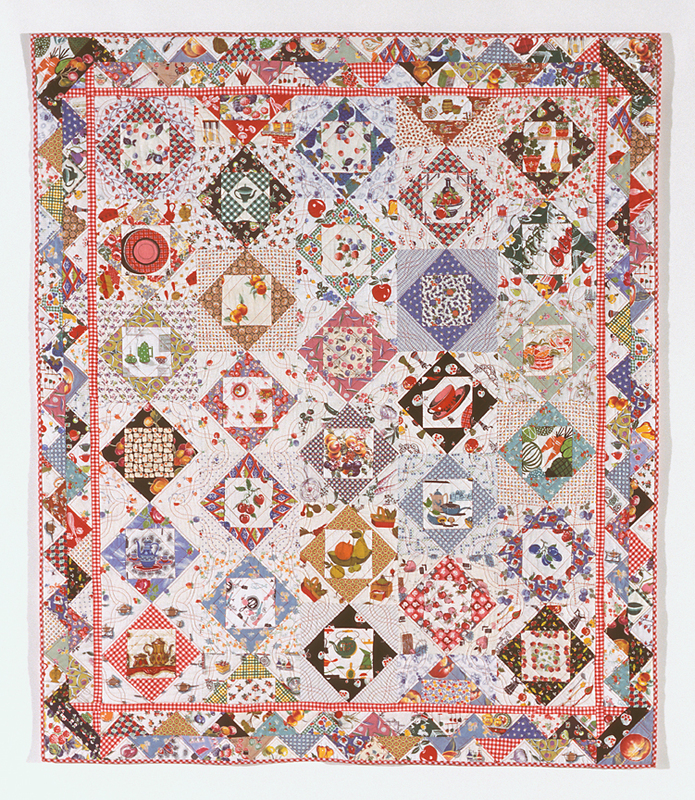 When originally applied, the border made a mush of the design of the quilt block. Adding the red check inner border did the trick, separating the two elements. Removing the border, redesigning the corner and adding the new inner border was relatively easy because I had used foundation piecing for the original border. Just beginning to try more machine quilting, I was fortunate to find a commercial quilting template that fit into the sashing of this quilt perfectly. It seemed to take forever to quilt, but I love the finished product. This is one of the first quilts when I was becoming aware of just how much fabric activity I could get into one quilt, lots and lots of shapes, colors, prints. Still LOVE it. Bragging rights: This quilt was juried into the American Quilter’s Society show in Paducah in 1998. Mary Mashuta wrote about The Food Quilt and my musings about it in her book Cotton Candy Quilts, and the border and its construction are featured in Foundation Borders by Jane Hall and Dixie Haywood. 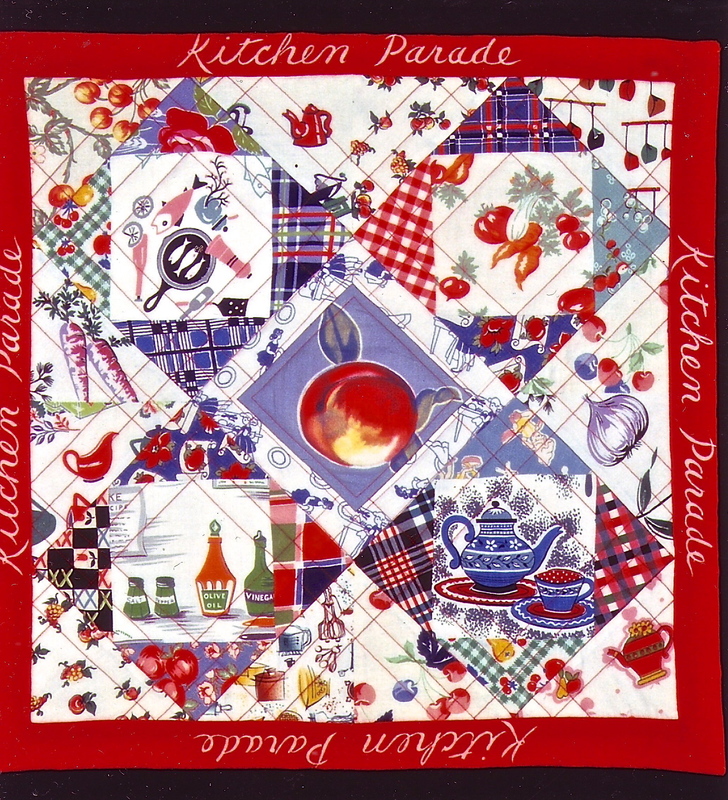 Kitchen Parade-A small quilt was made from the leftovers. It is fun-sized because the backing for this little piece was a single kitchen dish towel that had “Kitchen Parade” printed on all four sides, so the quilt was designed to be exactly the right size for the backing to be turned around onto the front to make a border. I wish I could say that I had used up all the leftovers I had collected for this quilt, but there is still plenty of vintage “food fabric” in fabric stash. Surprising how little was used up for both of these works. Plenty still for you–any takers??? Make me an offer. I started collecting these wonderful cuties when I was given my first one as a gift by my brother Dave and sister-in-law Wendy more that 15 years ago. There are rules to the collection: the pincushions are ceramic, fun, and include a retractable measuring tape. Often called “sewing caddies”, they may also have a slot for a small pair of scissors, a peg for a thimble, or a small dowel for a spool of thread. I love that these relics represent a time when every woman mended clothing by hand and needed ready access to sewing tools. And I think this particular girl looks like me, so I’m taking this as my blog avatar.